This year our parent group made a major transition, changing from a dues-paying organization affiliated with the National PTA, to a free, all-inclusive organization with a focus on helping all parents be engaged in their student’s education: ETHS Parents Engaged. A small, committed group of parents has kept this group running because we believe that parents helping other parents, and being the voice of the ETHS parent-body is important. If this group is going to continue, more parents need to participate in planning events, maintaining services (the listserve and website), and acting as liaisons with the school administration. 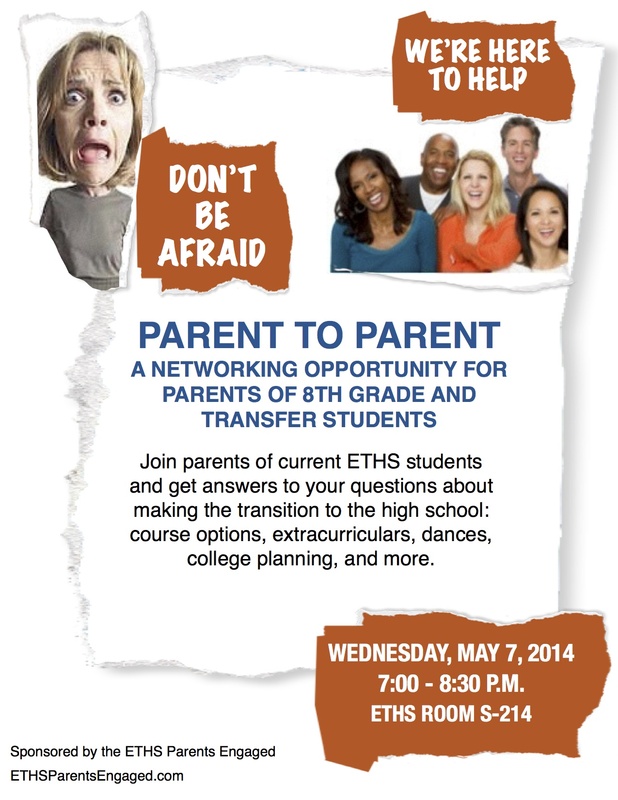 FYI – We also would like any “veteran” parents (if you’re a parent of a current ETHS student, you count!) to join us on May 7th for our annual “Parent-to-Parent” meeting to help answer questions from incoming freshman parents.